The legendary Pita Inn Restaurants have been a landmark in the Chicagoland area since 1982 when owner Falah Tabahi opened the first Pita Inn Restaurant on Dempster Street in Skokie, Illinois. From day one, Pita Inn offered delicious, affordable, and quality Mediterranean food as a unique alternative to traditional fast food. Pita Inn Skokie’s success encouraged us to reach out to our growing customer base and open more locations, including Pita Inn Wheeling in 1992, Pita Inn Glenview in 2003, Pita Inn Mundelein in 2013, and Pita Inn Naperville in 2018. Falah and his family continue to run the Pita Inn Restaurants in addition to the Pita Inn Market and Bakery, which were opened in 1998. Until this day, each one of our Pita Inn Restaurants boasts chefs personally trained by Falah, preparing fresh food on a daily basis. The numerous awards and positive reviews that we have been receiving for over three decades are a symbol of our dedication to providing great tasting, healthy food, and excellent service at unbeatable prices for the thousands of wonderful customers we enjoy serving everyday. By using only fresh ingredients coupled with unique Mediterranean spices, all served with a friendly smile; “Great Tasting, Healthy Food and Excellent Service at Unbeatable Prices” quickly became the resonating cornerstone of our business. Keeping our customers in mind with every move that we make, Pita Inn has consistently provided extremely affordable and quality food. Falah made it extremely clear that our guests should always leave Pita Inn delighted with the service and dining experience, and satisfied with the quality and taste of our food. Our legendary Business Lunch Special is a testament of providing quality food with a generous portion at an unbeatable price! Our humble philosophy since 1982 is simple yet comprehensive. We take care in selecting only the finest quality ingredients to prepare our food daily. Our suppliers are meticulously chosen holding cleanliness and freshness to our high standards of quality. Our employees are trained to inspect every shipment that arrives with extreme care. Any shipment that does not meet are quality check is immediately rejected. Walking into any Pita Inn establishment, whether it is one of our restaurants or the Market, our high esteem for quality service and cleanliness is apparent. From granite tables to the intimate surroundings, we spared no expense, taking care to preserve the Mediterranean ambiance our customers have come to enjoy. We were able to do all this without losing sight of our mission to provide "Great tasting, Healthy Food and Excellent Service at Unbeatable Prices!" Come visit us for a unique dining and shopping experience! The doors to Pita Inn Skokie opened in 1982. From a two person operation in 1982 to currently a staff of over 50 employees, Pita Inn Skokie is continuously growing to accommodate our increasing customer base. As the years past, The Pita Inn Skokie continued to grow, so large in fact, that it needed to expand. We stayed open as long as possible during our expansion project, without compromising the quality of our food or the safety of our loyal customers. The small yet cozy ambiance of Pita Inn Skokie brings together an exciting mix of people from varying ethnicities and cultures which allows for truly unique dining experience. In March 2012, Pita Inn marked its 30th year anniversary of serving the finest Mediterranean food in the Chicago land area. Still, Pita Inn Skokie remains our most popular restaurant. With the popularity of Pita Inn Skokie, and the fact that our customers were traveling far to reach us, The Pita Inn Wheeling opened in 1992. Being that we already had a winning formula, it did not take long for it to take off! Wheeling, at the time of its opening, provided our customers with more seating to accommodate families and groups, and more parking! In addition, the restaurant finished undergoing its second major reconstruction project, without closing a day, allowing for a warmer and more comfortable dining experience. Come visit us and let us know what you think of Pita Inn Wheeling’s new look! The popularity of The Pita Inn Skokie and Wheeling proved so great that in September of 2003, The Pita Inn Glenview opened right between the two. Hoping to alleviate the traffic of the other 2 locations, Glenview quickly put itself on the map, with success surpassing our expectations.If you want to know the secret to the success of Pita Inn Glenview, just ask the manager and he will fill you in- "We make our food with love". With ample seating and our newly expanded parking lot, our customers can enjoy their meals in our dining room, or, during the summer months, outdoors overlooking the beautiful fountain and lavish landscape. In keeping with the rich tradition of serving quality Mediterranean cuisine throughout the Chicago land area, Pita Inn opened a fourth location in Mundelein on March 17, 2013. Pita Inn opened a fifth location in Naperville on February 1, 2018. Come visit our largest location to date in Naperville! 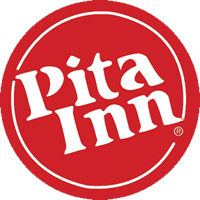 We Look Forward To Your Visit At Any One Of Our 5 Pita Inn Locations!